June 27, 2017, Suva: “As a Pacific Leaders organisation tasked with bringing transformational change through mainstreaming the blue-green economic model, PIDF seeks to forge partnerships with like-minded institutions. We look forward to establishing some model projects in our island countries to demonstrate that blue-green economy is not just pie in the sky but it is actually implementable, good for island communities’ resilience and profitable for businesses.” This comment was made by the PIDF Secretary General during the official Memorandum of Understanding signing ceremony with the Global Green Growth Institute (GGGI) held at the Nasese-based Secretariat. “There isn’t a more appropriate international organisation on green growth for PIDF to have an MOU with as our missions are so closely interlinked, that it was only natural this day would come for us to formally seal our relationship”, said PIDF Secretary General, François Martel. It follows exchanges and discussions held with the GGGI Pacific office here in Suva over the last 18 months and PIDF’s participation in the GGGI Annual Summit held last September 2016 on Jeju Island, South Korea. “For us to achieve this paradigm shift, it is important that we mainstream blue-green economy at all levels of society and also provide a proof of concept that this works by supporting the implementation of a number of initiatives in the various sectors of the economy”. 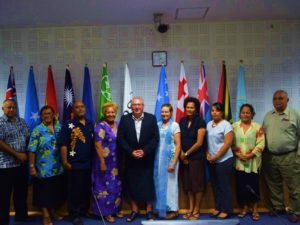 Secretary General Martel said that they feel that GGGI, through the experience it has garnered from implementing such work in other parts of the world, and some parts of the Pacific, is an ideal partner for PIDF in this work. “To mainstream the blue-green economy, countries need to ensure this permeates all policies developed by government and its institutions and we also need to ensure this is integrated into our educational systems, both formal and informal, as well as through traditional leadership, and here we look forward to implementation of such efforts with GGGI,” he added. The Director General of GGGI also expressed similar enthusiasm towards the new partnership. “We look forward to this partnership and are also excited about potential projects that will eventuate from this MoU as we are confident this will develop into a very close and genuine partnership between the two organisations”, said GGGI Director-General Frank Rijsberman. Members of GGGI in the Pacific are Fiji, Vanuatu, Papua New Guinea and Kiribati.